2. How can I keep up with this? I have been keeping up with a recipe a week, but have been really miserable posting here about it. We just finished a great dinner, and I decided I had to post the recipe here, so I don’t lose it. It’s my second time making it, and It’s sooo good. The original recipe was on printed in the Boston Globe Magazine. I make it in my cast iron dutch oven, and leave out the celery because Cathy’s allergic. Enjoy! Adapted from Jasper White’s 50 Chowders. With the oven rack in the lower-middle position, heat the oven to 400 degrees. In a Dutch oven over medium heat, cook the bacon until crisp, 4 to 7 minutes. Drain the bacon, then crumble it and set aside. Pour off all but 2 tablespoons of fat, adjust to medium-high heat, add the onions, celery, bay leaves, thyme, and 1 teaspoon salt, and saute until vegetables are very soft, about 10 minutes. Add the cayenne pepper and wine, bring to a simmer, and cook, scraping the bottom of the pot with a wooden spoon to dissolve the fond and cook off the alcohol, about 2½ minutes. 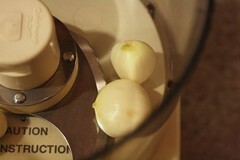 Set the pot aside off heat; remove half the onion mixture to a bowl and reserve. Cover the onions in the pot with half the potatoes, drizzle with half the butter, and sprinkle with salt and black pepper. Arrange the fish over the potatoes and sprinkle more salt and black pepper. Spread the reserved onion mixture over the fish and repeat layering with the remaining potatoes and butter; lightly season with salt and black pepper. Pour the fish stock into the pot, cover, and bake until potatoes are just tender, about 40 minutes. Uncover, sprinkle with reserved bacon, and pour cream over the top. Adjust heat to 425 and bake, uncovered, until the potatoes are very tender and the stew is beginning to brown around the edges, about 30 minutes longer. Remove from the oven, partially cover, and rest for 10 minutes. 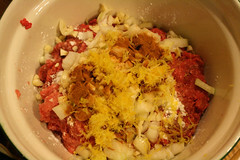 Stir just to mix, taste and adjust the seasoning, if necessary, sprinkle with the scallions, and serve. 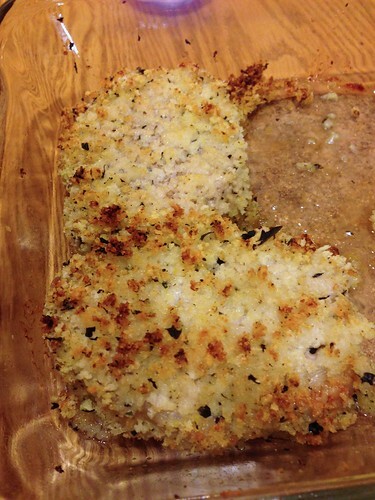 Recipe a Week: Lemon-Basil Pork Chops, a photo by Scott Hamlin on Flickr. I made these with the potatoes. And they were good and well worth the effort. I should make a point of returning to this simple but flavorful recipe. 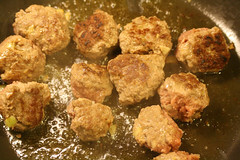 It was basically pork dipped in eggs and lemon juice and then dipped into bread crumbs containing grated lemon peel. Then bake. I was worried the lemon would not be noticeable, because the amount of lemon juice was quite small. But it hit just the right amount of lemon to be tasty, but not overpowering. 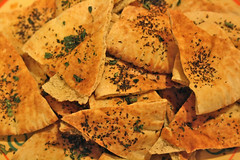 Recipe a Week: Baby Backed Potato Fans, a photo by Scott Hamlin on Flickr. 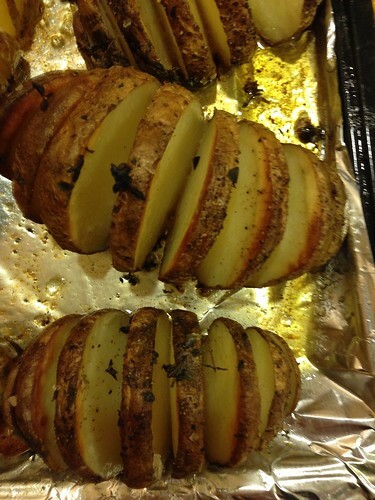 These were tasty, and it was fun fanning out the potatoes. But it was also more work to do the fanning. It might have been just as good and easier to chop these and spread them flat on a baking pan. 2014, a set on Flickr. It’s picture night, so I’m sharing some pictures from the beginning of 2014: snow storm pics and cats figure prominently. I’ve also started my picture a day project again. We’ll see if I can keep it up this year. I’ve also started trying to make a new recipe each week. January 1: All this Christmas clean-up makes you thirsty, a photo by Scott Hamlin on Flickr. Maybe I’m doing picture a day again… Here’s one for January 1 anyway! 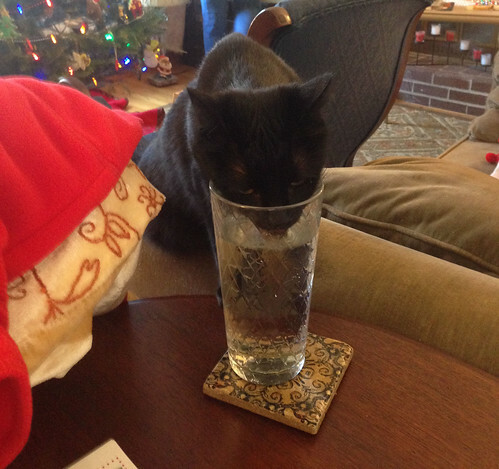 Mage decided to have a little drink from Cathy’s glass while she was cleaning up ornaments. My instinct, of course, was to take her picture and then say "No, bad kitty." End of 2013, a set on Flickr. I just posted a few photos from the end of 2013 of Flickr. Happy New Year! December 11 – 17, 2013, a set on Flickr. Picture night! Just posted this to Facebook as well. In this set, I have a few snowy photos, most of them at a weekend boy scout trip down to Camp Squanto (in Myles Standish State Park). Also, one of my orchids in my office is blooming again! Many of the boy scout pictures are password protected, so let me know if you’d like a guest pass link to see those. November 21 – December 8 2013, a set on Flickr. Picture night! I have been posting these on Facebook. I might try posting them to this old “family newsletter” blog too, just as a record I have a bit more control over. Anyway, I missed the past couple weeks of doing this and tonight I caught up. In this batch I’ve got (among other things) photos of leaf clean-up, a “turkey brigade,” Thanksgiving, and our town’s holiday parade. A few are password protected, so shoot me an email if you would like a guest pass link to this set. Just a quick test to see where posts from my family newsletter blog go (besides to this blog page). I’m still behind in reporting the recipes I’ve been making, but so far, I have been able to make one at least new recipe every week. 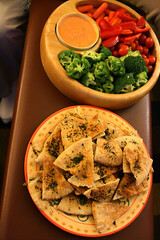 I made my week 4 recipes during the Ravens/Patriot play off game on January 22. 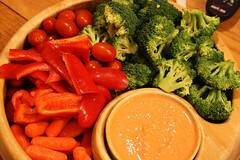 The hummus was an appetizer meant to be eaten during the game with veggies. The soup was a light meal after the game was over. 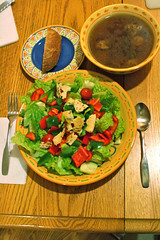 The two recipes came out fine, but the soup in particular took far too long to make. I spent most of my time in the kitchen while the game was on. I still had a small TV on, so I could pay it some attention, but in retrospect it would have been better to choose a dish that didn’t require quite some much attention. This dish was tasty, but very time consuming. I’m not sure that the amount of work involved gave enough of a payoff in taste to make this dish worth making again. This was a good alternative to the normal hummus we usually make. It was too liquid-y when I made it this time, because I only drained 1/2 the liquid from the chick peas. (This is the way I usually make the hummus, because otherwise it comes out too dry.) 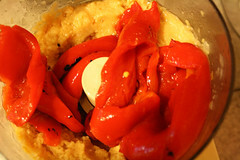 The juice from the roasted red peppers seems to keep it moist enough, so I will know to follow this recipe more closely next time. One should note that this recipe makes more than enough on it’s own. I doubled it, and had far too much hummus for our family of three as a result. Josh on The Wizard of Easton!